Pictured below is the noon horoscope for Mitch McConnell, born Feb 20, 1942 in Tuscumbia, Alabama although his website skips Alabama entirely and goes directly to his being 'raised in south Louisville' Kentucky. 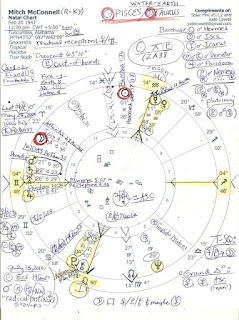 Yes, Tuscumbia is the birthplace of Helen Keller but perhaps Sen. McConnell's apex Neptune in a YOD pattern (with Sun sextile Moon - if he was born earlier than noon) gives us a clue: apex Neptune in a YOD configuration indicates one who in early years longs to be elsewhere in a better, calmer place. 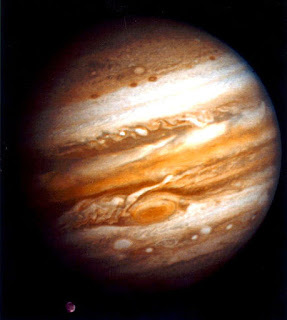 The senator may feel quite fearful and defensive when life fails to live up to the ideal vision of his Airy Jupiter - unless and until he learns to sacrifice whatever it takes in order to gain an intangible ideal; apex Neptune in a YOD pattern may indicate an illumined one who deeply delves into the mysteries of life. 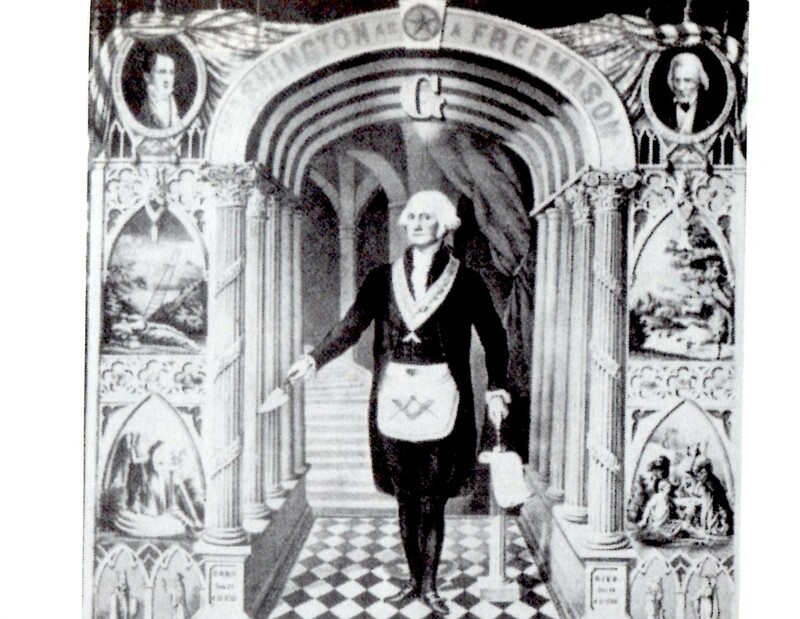 If you've ever read this blog before you know that politically speaking I take all references to words such as 'illumined' or 'illumination' as a link to the Illuminati and its over-arching plan to rule the world - just in case...wouldn't want to miss a glaring honker like that! Now I've heard that Baptists 'don't drink' but I also hear that most senators consider themselves to be far above the natural laws the rest of us are subject to! Well, if he doesn't drink, perhaps he writes poetry or plays violin when he's in seclusion. 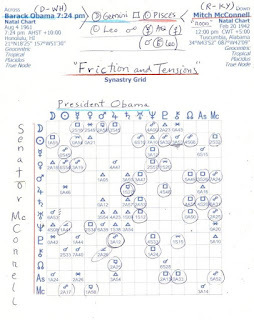 Senator McConnell has a Leonine Pluto/Chiron conjunction, the pair of plutocracy, oppression, fascism, sexism, and all the disenfranchising -isms you may care to name; plus, for him and for other Jupiterian Republicans, I'm-not-my-brother's-keeper-ism could be in the mix, too. And Senator McConnell keeps saying over and over (in an attempt to make it true) and speaking for us that the 'American people don't want' health insurance reform legislation to pass. Or is financial reform legislation his oft-repeated mantra of obstruction as he tells us what we (all) don't want? Both health and financial, if either bill's passage means success for the President. 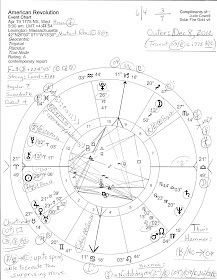 You see in his chart a massive trio of Mars, Saturn, and Uranus in stubborn, intolerant, greedy Taurus (the dark side of Taurus.) Those with Mars conj Saturn are not accustomed to having their plans challenged and can launch vicious attacks against adversaries, even to the point of physical violence; Saturn/Uranus conjunction folk have a talent for putting inspirations and innovations (Uranus) into form (Saturn), and lots of self-discipline for reaching their goals...Senator McConnell is purposeful and is not afraid of responsibility; he belongs in the socio-political realm...in a word, Politics. He's impatient with superficial people and may consider Mr. Obama to be one. Don't trifle with McConnell! Sun Pisc/Moon Aries: independent; big talker; touchy; quarrelsome; understanding but self-centered; vivid imagination; willful; nervous; a quick thinker; introverted poet vs zealous crusader and explorer. Weaknesses: fear that abilities and worth won't be noticed making him go overboard in efforts to win; taking himself too seriously makes him touchy, temperamental, and argumentative. Images for Integration: In tattered rags, the small, obscure young servant named Arthur pulls the sword from the stone and becomes king of Camelot. Sun Pisces/Moon Taurus: fantasy world vs mundane world; caring and capable; lover of harmony; emotionally demonstrative; sociable, charming, and sensual; a gentle, compassionate nature (?) backed by a real stubborn streak (! ); appears compliant and low-profile but knows what's right for him - has a quiet strength that tells others, don't trifle with me; dreamer and realist. Weaknesses: strongly subjective, emotional view of life; possessiveness; tends to maneuver situations to satisfy personal security needs; stubborn, old-fashioned, clings to the past. Sun inconjunct Pluto (150 degrees, aka, a quincunx): can take on duties that others neglect, then feel bitterly resentful about it; may overreact to the expectations of others; deep guilt causes continual striving to prove he's doing his share; makes punishing demands on himself so that moderation is needed to avoid health consequences; may compare himself to others who become bitter when forced to follow his example of overdoing; obsessed with gaining the admiration of others to whom he feels inferior; sacrifices must be made to realize ambitions; must learn to accept his limitations; can focus efforts on a particular objective and ignore nonessentials; wrestling with other people's wills should be avoided for best results - the less conflict and tension he creates in dealing with others, the better. Since President Obama moved into the Oval Office, Senator McConnell seems to me to be more energized than ever to create conflict as part of the GOP's 'anything to undermine Obama' campaign in order to ensure, as Rush Limbaugh announced at the outset in January 2009, the failure of the Obama Presidency. Never mind that where a US President goes, there goes our nation. *Nemesis = the unbeatable foe; divine retribution; arch enemy. He's only one man, a melting political icycle, I hope.